I snagged this off of Kindle ages ago, when, having burned through the first half of M*A*S*H, it suddenly occurred to me that I knew very little about the actual Korean War itself. While it may seem like a good time on the television screen, outside of the Pusan Perimeter, the landings at Inchon and the perils of getting too close to the Yalu River I didn't know much else. This Kind Of War was an attempt to remedy that. What I found out was that Korea was a bloodier and more controversial conflict than I think I had ever imagined. There's lots of echoes from the past that prove remarkable timely and T.R. Fehrenbach pulls no punches in recounting the missteps and mistakes that lead America into an ill-defined war that it was ill-prepared for, despite flaring up a bare five years after the end of the Second World War. Fehrenbach also provides a complete picture of different aspects of the conflict- looking at the way prisoners of war were treated (by the Americans at Koje-Do and the North Koreans) and who fared the best amongst the captured UN forces (the British and the Turks held up well, the Americans, not so much.) He looks at the political forces driving the conflict and how frustrating it can be for soldiers when the political will doesn't match up with the reality on the ground at the front. Does any of this sound familiar? That's what kept running through my head as I was reading this- going to a far away country, committing American blood and treasure to defend 'the far frontier' as Fehrenbach calls it, but to what end? What's the end game? If it's uniting Korea, then unite it- but the military wasn't allowed to do that- probably because they got very nervous when McArthur started talking about rolling right on into Manchuria and saying things like 'let's use the A-Bomb again' but acting through the lens of the United Nations meant that there had to be consensus on the next moves. And that meant the politicians were running a war they weren't necessarily prepared for. The military- even though Fehrenbach isn't exactly impressed with the state of it at the start of the conflict- figured things out pretty damn quickly. Having large amounts of Chinese and North Korean troops trying to kill you tends to focus the mind somewhat, I'd imagine. The politicians however had other ideas- and that's what turned out to be the worst part of the book for me, anyway. The two years of brutal stalemate along the 38th Parallel as US/UN Forces fought for control of various strategic hills at great cost in human lives. 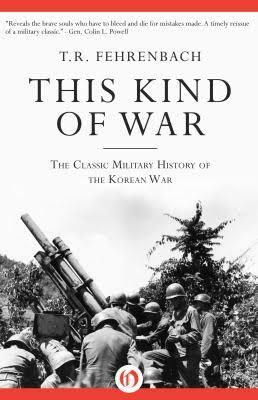 Overall: A brilliant military history of a conflict that was more complex than many people realize, this is required reading for history buffs or, if you're like me, folks that want to scratch an itch to find out just what the hell were they doing in between martinis in all those episodes of M*A*S*H. While the Korean Conflict was over a half-century ago now, there are lessons here for the policymakers of today that should make this book required reading for anyone in charge contemplating putting military forces in harms way. **** out of ****.